4/30 Cup of Coffee: Pawtucket was firing on all cylinders in an easy victory while Portland remained hot and Greenville fell in a tight extra inning affair. A seven run second inning propelled the PawSox past the Lehigh Valley Iron Pigs (PHI) 8-0 in a rain shortened five inning contest. Anthony Ranaudo tossed a complete game shutout, allowing just two hits and two walks while striking out seven. In the second, a sacrifice fly from Corey Brown in addition to RBI singles from Christian Vazquez and Daniel Nava put the PawSox up 3-0. The big blow for Lehigh Valley came when Bryce Brentz smacked a two-out grand slam, giving Pawtucket a comfortable seven run margin. 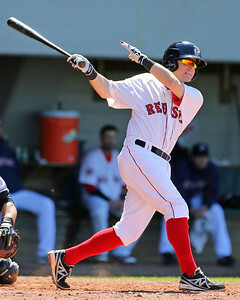 Brock Holt added an RBI single in the third to cap scoring for the PawSox. 4/29 Cup of Coffee: All three teams in action on Monday night came away with victories. Salem pounded 12 hits, including six for extra bases in its win, Portland's middle infielders were on base eight times, and Pawtucket prevailed in the 11th inning. Pawtucket eventually found itself on the winning end of a pitcher's duel, beating the Lehigh Valley Iron Pigs (PHI) 4-2 in 11 innings. 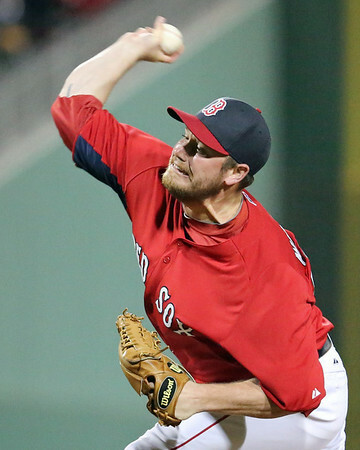 Allen Webster and former PawSox lefty Greg Smith locked horns, allowing just one run apiece. 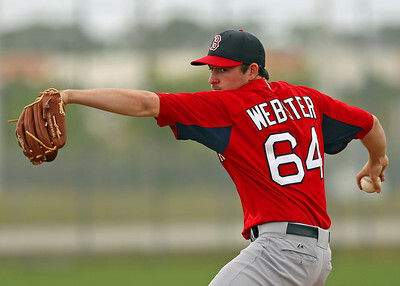 Webster went six innings, giving up five hits and walking two while striking out one. Chris Resop tossed a scoreless seventh, but Drake Britton struggled, allowing a run on five hits, walking two, and hitting a batter in 1 2/3 innings. Tommy Layne earned the win, throwing 2 1/3 hitless frames. Knotted at two in the 11th, Brock Holt led off with a single and was bunted over to second by Ryan Roberts. After Daniel Nava was given an intentional pass, Bryce Brentz walked to load the bases. With two outs, Brandon Snyder ripped a two-run single to put Pawtucket on top. Nava was on base three times, going 2 for 4 with a double and a walk. Holt also had two hits, and Brentz delivered a solo home run in the third. The athletic 22-year-old has been a jack-of-all-trades for the Drive this season, starting games at second base, third base, and left field. He appeared at all three positions this week, while hitting well enough to earn his first SoxProspects.com Player of the Week award. Drafted in the 11th round of the 2013 draft out of Nova Southeastern University, Asuaje put up good numbers in Lowell last season, batting .269/.366/.368 in 171 at-bats. He is a fun player to watch due to his plus speed, and his defensive flexibility makes him even more valuable to the organization. While he is being overshadowed by some other strong performances to start the season, Asuaje is an under-the-radar prospect who could be a utility player at the major league level. A number of roster moves highlighted this week's transactions. Trey Ball, who had been in extended spring training, joined Greenville, and right-hander Pat Light was promoted to to Salem. 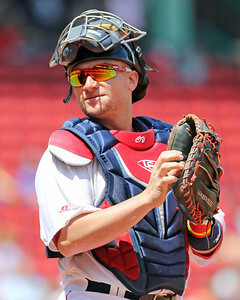 Daniel Nava was optioned to Pawtucket on Wednesday, with Alex Wilson being promoted to Boston. Wilson's stay in Boston lasted just one day, as he returned to Pawtucket on Thursday after Shane Victorino returned from the disabled list. The final move of the week saw infielder Brock Holt, who had been hitting well in Boston, return to Pawtucket as Will Middlebrooks was activated from the disabled list. 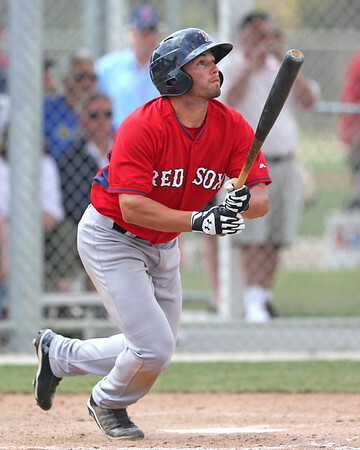 Brendan McGair of the Pawtucket Times caught up with Nava, who remains confident even after a tough start to 2014. 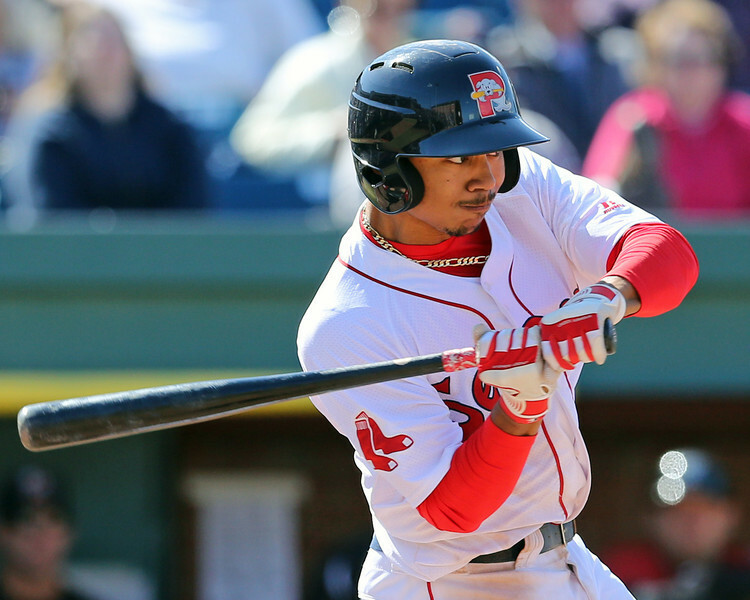 Mookie Betts (pictured, above) and Brian Johnson were named the SoxProspects Players of the Week for the week of April 14-20. Kevin Thomas of the Portland Press Herald looked at the meteoric rise of Betts, who is impressing the Portland coaching staff during his impressive start to the 2014 campaign. 4/28 Cup of Coffee: With a trio of top pitching prospects going, it was the offense that stole the show on Sunday. The teams combined to score 42 runs over four games, with Greenville and Jantzen Witte (pictured) accounting for half of those, helping Trey Ball get the win in his 2014 debut. 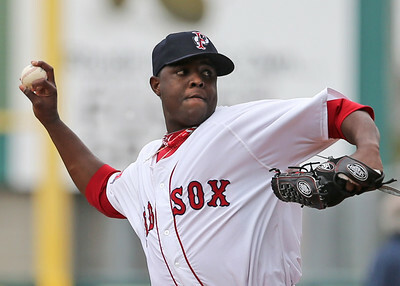 ﻿Rubby De La Rosa had his first poor start of the season, as the PawSox fell to the Lehigh Valley Iron Pigs (PHI), 9-7. De La Rosa went the first five innings, allowing six runs, four earned, on four hits, walking three and striking out four. He allowed five runs in the third inning, which was more than he allowed in the whole season prior to yesterday’s start. Chris Hernandez followed him, surrendering three runs in his three innings of work. 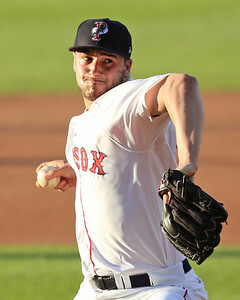 PAWTUCKET, R.I. -- Friday night marked Matt Barnes’ first start of the season, but outside of a couple of hiccups and an abbreviated pitch count, you would hardly know it based on the five strong innings the right-hander put together. 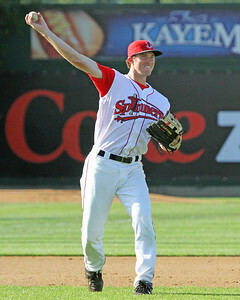 Barnes is currently the eighth-ranked prospect on SoxProspects.com, coming off a solid 2013 season spent mostly in Portland in which he struck out 142 batters in 113 1/3 innings with a 4.13 ERA. The 6-foot-4 UConn alum owed the delayed start to his season this year to a sore shoulder. Any mention of a shoulder injury for pitchers usually will raise red flags, but in this case, Barnes described it as minor. Read the full story on ESPNBoston.com. 4/27 Cup of Coffee: Salem took the only loss in the system, while Greenville delivered on both sides of the ball. Pawtucket used a four-run frame to pick up the win and some clutch hitting from Henry Ramos (pictured) won it in the 15th for Portland. The PawSox used a four-run seventh to topple the Lehigh Valley IronPigs (PHI), 7-5. PawSox starter Brandon Workman picked up the win, allowing four runs on nine hits and two walks while striking out three. Rich Hill pitched two perfect innings in relief of Workman and Alex Wilson notched the save despite allowing an earned run in the ninth. The Pawtucket offense struck early, plating three runs in the second to overcome an early deficit. Corey Brown hit a two-run single to tie the ballgame and a key throwing error from the Lehigh Valley catcher allowed the go-ahead run to cross. After the IronPigs jumped out to a 4-3 lead, the PawSox recorded four straight singles to open the seventh. Brock Holt's single tied the score and Daniel Nava lofted a sacrifice fly to give the PawSox the lead. Bryce Brentz delivered the final blow with a two-run single to put Pawtucket up 7-4. 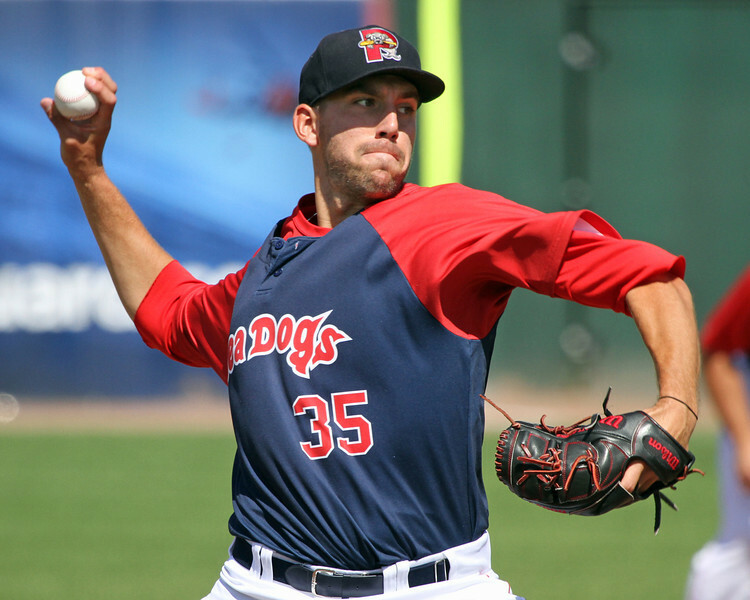 4/26 Cup of Coffee: It was a big night on the farm, as 2011 top pick Matt Barnes made his return to the McCoy Stadium mound to lead Pawtucket. Salem won its fourth straight behind a second consecutive sterling performance from Brian Johnson (pictured). Less positive were the results for Portland, who lost despite cranking out 16 hits, and Greenville, whose ninth-inning rally fell short. 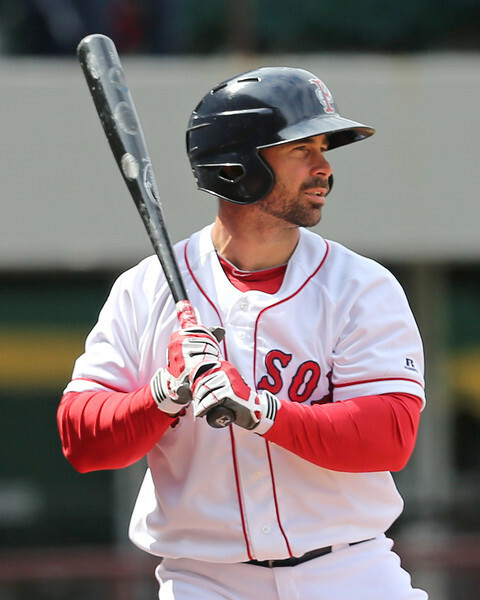 After missing the first month of the season with shoulder soreness, Matt Barnes made his much-anticipated 2014 debut for Pawtucket. The early returns were good, as Barnes got the win in a 6-2 victory over the Rochester Red Wings (MIN). The former Connecticut Husky allowed two runs (one earned) on six hits in five innings, walking and striking out two apiece. 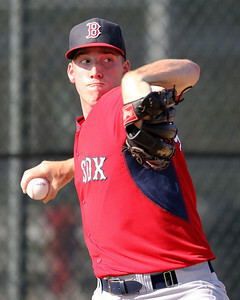 SoxProspects.com Managing Editor Matt Huegel was in attendance, and reported that Barnes touched 97 mph on the stadium radar gun. Tommy Layne and Drake Britton tossed two scoreless innings apiece to preserve the contest for the PawSox. The offense was led by a streaking Christian Vazquez, who was 2 for 4 with a pair of doubles, giving him a team-leading nine on the season. In his last six games, the catcher is 8 for 22 with five doubles. Daniel Nava made his first appearance since being optioned to the minors, and went 1 for 2 with two walks and a run scored. Garin Cecchini walked three times, and Corey Brown hit his first home run of the season. 4/25 Cup of Coffee: Red Sox affiliates earned a split on Thursday. Salem had a comeback win in the High A debut of Pat Light, as Light's old teammates in Greenville cruised to victory led by Bo Greenwell (pictured). 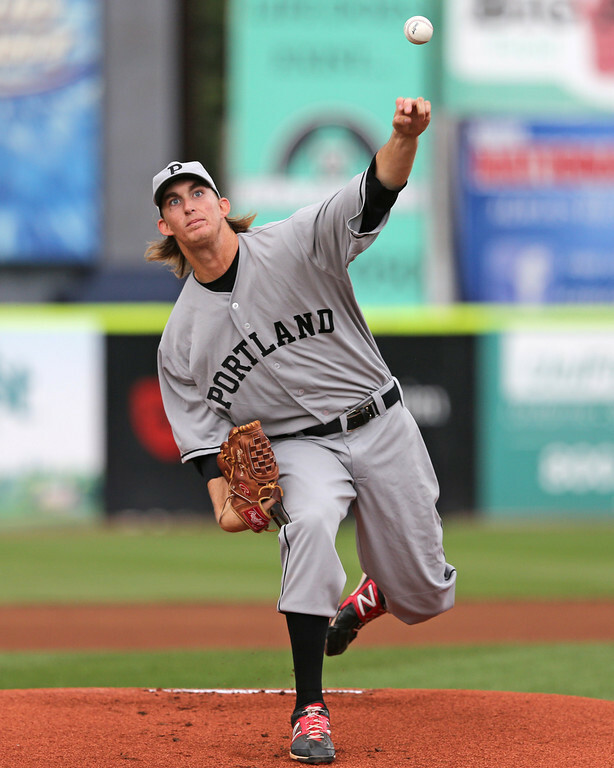 Pawtucket struggled against a former Sox farmhand, and Portland fell in extra innings. Pawtucket struggled to an 8-1 loss to the Rochester Red Wings (MIN). The PawSox offense generated only three hits in six innings off of Red Sox 2006 supplemental first rounder Kris Johnson (MIN), who took the win. Two of those hits came off the bat of Bryce Brentz, who is now riding a six-game hitting streak. Anthony Ranaudo got the start for Pawtucket, allowing three runs (two earned) on six hits in just three innings, walking and striking out four apiece. Alex Wilson, back with the PawSox after his one-day recall, struck out one in a perfect ninth, and has yet to allow a run in nine innings in 2014. CNN Anchor John Berman is a good friend of the site. Check out his take on the Michael Pineda pine tar incident. 4/24 Cup of Coffee: All three affiliates in action took home victories Wednesday behind strong pitching performances. Portland was canceled due to inclement weather. The Pawtucket Red Sox topped the Rochester Red Wings (MIN) in a tight game Wednesday by a score of 3-1. Although he didn't get the win, starter Allen Webster (pictured) gave a worthy performance as he struck out six and surrendered only one run in 6 1/3 innings. He entered the top of the seventh inning with the game scoreless, but was charged with an earned run after being relieved by Wilfredo Boscan, who allowed an inherited runner to score on a sacrifice fly. The deficit was short lived, however, as the PawSox would rally to score three runs in the bottom of the eight inning. The big inning began with a pair of one-out walks from Alex Hassan and Ryan Roberts. With two runners on, Garin Cecchini delivered a pinch-hit double, his third of the season, scoring two and giving the PawSox the lead. Cecchini would come around to score an insurance run on an RBI-single from Ryan Lavarnway. Lavarnway, who was behind the plate for the game, was the lone Pawtucket player with two hits, going 2 for 4. 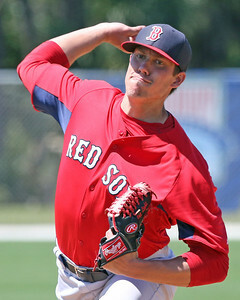 After starting the season in extended spring training, left-handed pitcher Trey Ball is moving north to join the Greenville Drive, as confirmed by SoxProspects.com sources. Ball will take the roster spot in Greenville being vacated by Pat Light, who will be promoted to High A Salem. The roster moves could be made official as soon as Thursday. 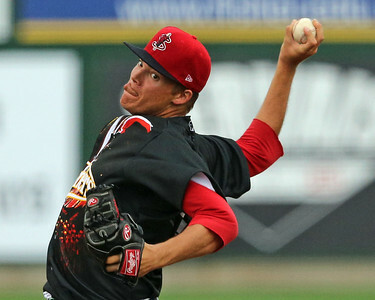 Ball, who was drafted seventh overall in the 2013 draft as an Indiana high schooler, is a highly projectable and athletic pitcher, who also could have been a first-round pick as an outfielder. He features a low-90s fastball, shows good feel for a changeup, and has made great strides with his curveball despite not beginning to use it until his junior year of high school. While expectations will be high for Boston's earliest draft pick since Trot Nixon, Ball only recently started focusing on pitching full-time, and he is still very raw on the mound. While he has arguably the highest upside of any pitcher in the system, he is a long way away from that ceiling. During the season we will be featuring videos here from the SoxProspects YouTube page. New videos from spring training will be going up on YouTube every Wednesday until the end of May. Today's video is of up-and-coming prospect Rafael Devers. In it, you can see the high ceiling third baseman unleash his quick bat several times. Follow the link to the YouTube page to view many other prospect videos. The Red Sox will recall right-handed reliever Alex Wilson from Triple-A Pawtucket for Wednesday's game against the New York Yankees. To make room for Wilson on the 25-man roster, outfielder Daniel Nava will be optioned to Pawtucket. This news was originally reported by Lou Merloni on WEEI radio, and confirmed by Alex Speier of WEEI.com. With the bullpen depleted, the Red Sox reportedly wanted an extra arm in the bullpen for Wednesday's game. Wilson, who threw 1 1/3 innings on Monday, was a better immediate option than Brandon Workman or Rubby De La Rosa, who have started the past two games for the PawSox. Wilson, 27, has pitched eight scoreless innings so far in 2014, allowing only four hits, striking out nine and walking five. A second-round pick in the 2009 draft, Wilson made his major league debut in 2013, appearing in 26 games across three stints with Boston. He had a 4.88 ERA and 1.735 WHIP in 27 2/3 innings. 4/23 Cup of Coffee: Portland was the lone victor of the evening, as Pawtucket's bullpen faltered and Greenville lost a tight battle. In a game that appeared to be in the PawSox grasp, the Rochester Red Wings (MIN), stormed back for a 7-5 victory. Rubby De La Rosa (pictured) tossed six beautiful innings, allowing just one run on three hits and a walk while striking out seven. 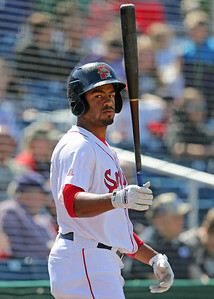 Betts continued his season-long hit parade en route to earning his second SoxProspects.com Player of the Week nod (previously April 3-6), bookending his week with multi-hit performances going 2 for 5 with a double Monday against Binghamton (NYM) and finished his week going 4 for 5 with a home run at New Britain (MIN) Saturday. The SoxProspects.com sixth-ranked prospect is currently leading the Eastern League in batting average and on-base percentage. Season Line: .452/.500/.694, 28 for 62, 2 HR, 7 2B, 1 3B, 7 BB/7 K, 7 SB (1 CS), 15 G.
In case the stat-line didn't make it clear enough, Johnson earned his Pitcher of the Week honors on the strength of his six-inning stretch of perfection last Friday at Winston-Salem (CHW) with five strikeouts. This outing represented a welcome rebound for Johnson who opened the season well but scuffled in his two subsequent starts. 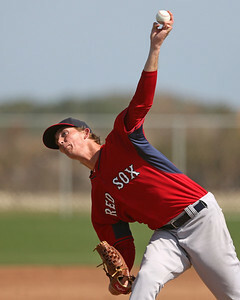 He is currently the twentieth-ranked prospect in the organization by SoxProspects.com. 4/22 Cup of Coffee: The Red Sox affiliates celebrated Patriots' Day by sweeping away the competition. Henry Owens returned to form for Portland as the Sea Dogs never trailed in their win, while a pair of Salem hurlers combined for a three-hitter. Greenville and Pawtucket also got strong pitching performances in their victories. A sixth-inning rally carried Pawtucket to a 4-3 win over the Buffalo Bisons (TOR). Brandon Workman took the mound for his second start since rejoining the PawSox, and found himself matched up against Toronto's top pitching prospect, Marcus Stroman. Workman was solid in his five innings, allowing only four hits and striking out eight without issuing a walk, but a pair of home runs hurt him and he departed with his team down 3-1. Chaz Fiorino, the newest addition to our scouting staff, introduced The Write-Up this week, where he provides in-depth scouting reports from the field. 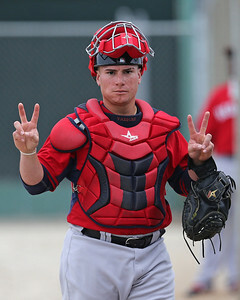 The first installment focused on Garin Cecchini and Christian Vazquez (pictured). 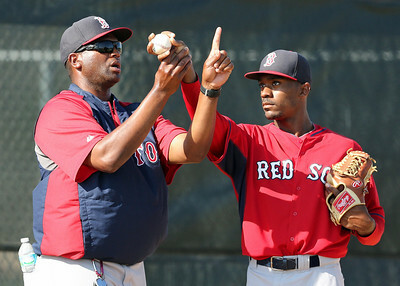 SoxProspects.com's Feature Writer Tim Healey talked with Portland manager Billy McMillon about what it is like to manage the Sea Dogs after playing for them back in 1995. McMillon also discusses how working his way back to the major leagues as a coach is far different from working his way up as a player. As WEEI.com's Alex Speier noted in his Minor League Roundup on Sunday morning, Mookie Betts may be the best Red Sox prospect in the minors. After going 4 for 5 with a home run on Saturday, Betts is now hitting .453/.492/.717 in 59 plate appearances this year. His .489 batting average on balls in play is unsustainable, but the toolsy 21-year-old has shown that he is not overmatched against the more advanced arms in the upper minors. 4/21 Cup of Coffee: Only one game was played on Easter Sunday, with Salem falling to the Winston-Salem Dash (CWS), 10-8. William Cuevas struggled mightily, giving up eight runs while only recording two outs before being pulled in the first inning. Kyle Kraus was able to limit the damage, allowing only one run over the next 5 1/3 innings, allowing Salem to creep back into the game. Salem scored two in the second and two in the third to cut the deficit in half. After Reed Gragnani hit an RBI double in the seventh, Salem had cut the lead to two. That was as close as they would get, as they dropped to 9-8 on the season. Ryan Dent (pictured) went 3 for 5 with two doubles and a triple, Gragnani went 3 for 5 with a double, and Jonathan Roof went 2 for 4 with a double and a walk. 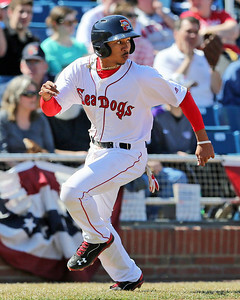 4/20 Cup of Coffee: Mookie Betts (pictured) collected four hits to lead the Sea Dogs to victory. Meanwhile, the PawSox split a twin bill against New Britain, Salem blanked their opposition and Greenville was suspended after six. The PawSox took game one of their doubleheader against the Buffalo Bisons (TOR), 1-0. Anthony Ranaudo bounced back from a string of mediocre performances, throwing six innings of two-hit ball while walking two and striking out five. Drake Britton pitched a scoreless seventh, and Chris Resop pitched the final two innings to pick up his third win on the season. The PawSox struggled against the Buffalo pitching staff, as the two teams carried a 0-0 tie into the ninth. Christian Vazquez delivered Justin Henry with a walk off single after Henry had entered the game as a pinch runner. 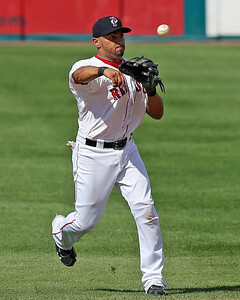 Shane Victorino went 0 for 3 in his first game action, and played six innings in the field. 4/19 Cup of Coffee: Portland took both ends of a doubleheader, thanks to solid pitching and a huge night from Travis Shaw. Salem easily handled Winston-Salem, while the PawSox faltered late. The bullpen could not hold on to a late lead as Pawtucket fell to the Buffalo Bisons (TOR), 7-3. Allen Webster took the mound for the PawSox, hurling 5 1/3 innings, allowing two runs on four hits and four walks while striking out three. Rich Hill picked up the loss, as he allowed three runs on two hits and two walks in 1 2/3 innings of relief. Jose Valdez added two innings of relief, allowing two runs on four hits and two walks. 4/18 Cup of Coffee: It was a strong night for starting pitching throughout the system, as Rubby De La Rosa, Chris Hernandez, Corey Littrell, and Teddy Stankiewicz (pictured) all pitched well. Salem and Greenville each took advantage of sloppy play by their opponents, and Portland was postponed for the third game in a row. In game one of a doubleheader, the PawSox pitched their way to a 2-1 victory over the Rochester Red Wings (MIN). Rubby De La Rosa continued his fantastic start to the season, tossing six innings, allowing only one run on four hits, walking one and striking out five. His ERA actually rose to 1.08 following this performance. For a while it looked like he was going to be the tough-luck loser, but the PawSox scored a run in the seventh when Christian Vazquez doubled home Garin Cecchini. The score was tied until the 11th, when Heiker Meneses drove in Bryce Brentz with a single. PORTLAND, Maine -- With the sun setting and the temperatures dropping last Thursday evening, a bundled up Billy McMillon hopped out of the dugout and jogged to home plate as the public address announcer called his name and the half-filled crowd at Hadlock Field stomped their collective feet. 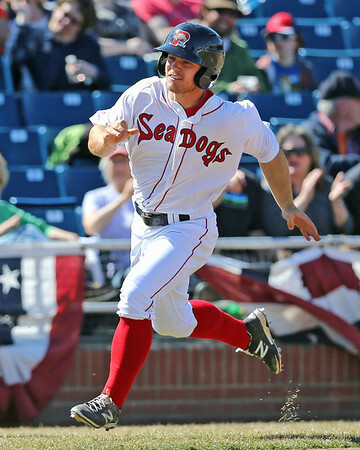 It was Opening Day for Double-A Portland, and for the first time in 19 years, McMillon suited up as a Sea Dog. The first time McMillon donned the Portland jersey was way back in 1995 -- when Bill Clinton was in the middle of his first term, America Online was gearing up to offer World Wide Web access to the general public, and many of this year's high school draft picks to-be were born. McMillon was a 23-year-old outfielder making his way up the Florida Marlins farm system. 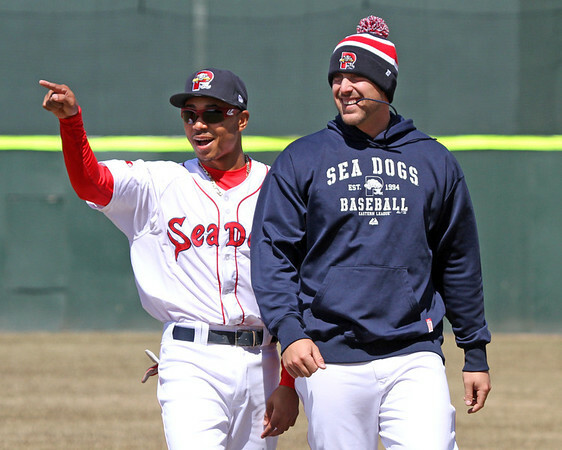 Two decades later, McMillon is now the first-year manager of the Sea Dogs. He spent the last two seasons with High A Salem, the two before that with Low A Greenville. 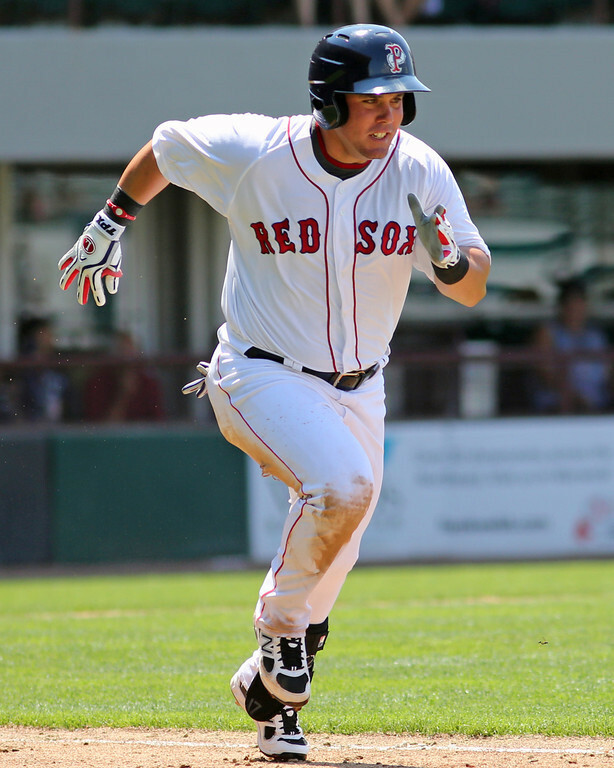 After he guided Salem to the Carolina League championship to cap off 2013, the Red Sox bumped him up to Portland. Just like his players, McMillon is trying to climb the ladder to the major leagues. It isn't quite the same the second time around. Read the rest on ESPNBoston.com. Photo credit: Billy McMillon by Kelly O'Connor. 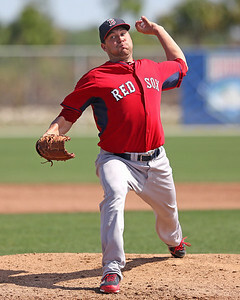 Tim Healey is a feature writer for SoxProspects.com. Follow him on Twitter @timbhealey. 4/17 Cup of Coffee: Pawtucket edged out a one-run victory while Greenville lost by just one score. Salem dropped both halves of a doubleheader and Portland was postponed again due to rain. The Pawtucket Red Sox were able to hold on and win by a score of 7-6 after an early offensive explosion in Wednesday's games against the Rochester Red Wings (MIN). The PawSox jumped out to an early lead in the contest, going up 7-0 after the top of the fourth inning. The scoring began in the third inning when outfielder Alex Hassan doubled home Heiker Meneses, who singled to leadoff the inning. Bryce Brentz and Brandon Snyder also picked up RBI in the inning, Brentz's coming on a two-out single. 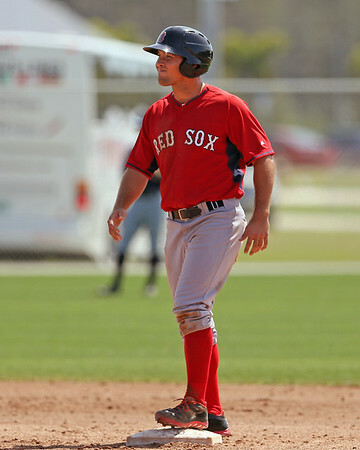 In the fourth, Hassan picked up another RBI-double, and catcher Dan Butler (pictured) picked up a pair of RBI on a two-out bases loaded single. Starter Brandon Workman lasted only 3 1/3 innings and was charged with three earned runs. Workman yielded only one hit in the first three innings, but ran into a bit of trouble in the fourth. He was lifted with one out in the inning after giving up two hits and a walk, which loaded the bases. Reliever Chris Resop came in and gave up three singles in a row before getting out of the inning. Drake Britton picked up the save after pitching two scoreless innings. Four PawSox collected three hits in the game; Hassan, Meneses and Brock Holt, who each went 3 for 5 with two runs, and Ryan Lavarnway, who went 3 for 4 with a walk. 4/16 Cup of Coffee: Rain dominated Tuesday's action, postponing Pawtucket, Portland and Salem. Greenville managed only four hits in a loss to rival Charleston. Pawtucket's game against the Rochester Red Wings (MIN) was postponed due to a combination of rain and snow. The contest will be made up today as the second game of a doubleheader. Brandon Workman will make his 2014 Triple-A debut against left-hander Scott Diamond. Portland's game against the Binghamton Mets (NYM) was postponed due to rain. The game will be made up as part of a doubleheader on May 21st. It's always fun when a player off the radar screen of even the most diehard prospect maven takes home Player of the Week honors, and Mager, a undrafted free agent out of Division II Rollins College (FL) in 2012, did just that. He did most of his damage against Kannapolis (CHW) going 4 for 4 with three runs scored and taking a base-on-balls Friday, April 11 and hitting both home runs and his double in the series. Season line: .375/.487/.668, 9 G, 12 for 34, 3 HR, 1 2B, 7 R and 6 RBI. 4/15 Cup of Coffee: Top-10 prospects Anthony Ranaudo and Henry Owens were not sharp, but both were lifted up by nine-run outbursts as Pawtucket and Portland picked up victories. Salem's hot start is becoming a distant memory as it dropped its fourth in a row, while the Greenville bullpen struggled to end the Drive's five-game winning streak. Pawtucket pounded out 15 hits in its 9-5 win over the Rochester Red Wings (MIN). Bryce Brentz led the attack, with a 3-for-5 evening that included a seventh-inning solo homer. Ryan Lavarnway also added three hits for the PawSox, and has now reached safely in six straight after starting the year 0 for 14. Justin Henry reached base four times, going 1 for 2 with a walk, and Alex Hassan drove in a pair as part of his 2-for-4 effort. 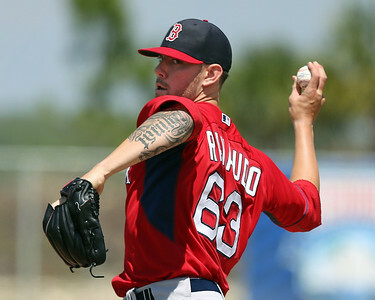 Starter Anthony Ranaudo has yet to get on track in 2014. The tall right-hander picked up his first win of the year, but has allowed at least four runs in each of his three starts. On Monday, Ranaudo gave up five on eight hits in five innings. Veteran left-hander Rich Hill was excellent in relief, giving up only one hit and striking out three without issuing a walk in 2 2/3 innings. Mookie Betts (pictured) meteoric rise from a generally unknown player to substantial prospect has continued into the 2014 season as the 21-year-old has gotten off to a torrid start. In nine games in Double-A Portland, Betts is 16 for 35 with 11 runs, and 4 steals. His line to start the season is .467/.512/.743. Alex Speier of WEEI.com takes a look back at Betts ascension last season in a piece that includes comments from Red Sox minor league hitting coordinator Tim Hyers. Portland left-hander Henry Owens is also off to a fast start having yet to give up a run in 12 2/3 innings while striking out 18 for the Sea Dogs. In this piece for SportsonEarth.com, Tim Casey caught up with Owens to discuss, among other things, the beginning of his season. 4/14 Cup of Coffee: Pawtucket and Greenville each got wins in extra-innings, with some interesting bullpen performances in each game. 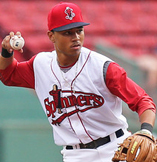 Mookie Betts did his best to lead the Sea Dogs, Brian Johnson had his second straight tough outing, and Wendell Rijo (pictured) hit his first professional home run. It took 12 innings, but the PawSox escaped with a 7-5 victory over the Buffalo Bisons (TOR). Allen Webster got the start, and was shaky throughout his five innings. He walked four while striking out only one and surrendering four runs. He did manage to keep the ball on the ground, recording 12 groundouts compared to only three flyouts. The PawSox stayed in the game thanks to some timely hitting, with Mike McCoy delivering a three-run double to tie the game in the fourth. With the first week-and-a-half in the books, Chris, Ian, and Matt got on the horn after Pawtucket's first homestand of the season to ruminate on the state of the system's Triple-A affiliate. The guys traded notes on Allen Webster, Anthony Ranaudo, Rubby De La Rosa, Garin Cecchini, and more. In addition, the guys took a quick spin around the other affiliates, highlighting the top performers so far on the young season, as well as answering a couple of your emails. FEEL THE POWER OF THE PODCAST!! Links and player after the jump. 4/13 Cup of Coffee: The Red Sox farm system took home the split as both Pawtucket and Salem failed to produce in the batters box while the Sea Dogs rode an offensive outburst to victory and Greenville received a strong start from Teddy Stankiewicz (pictured) en route to the win. The Pawtucket Red Sox managed only four hits as they fell to the Buffalo Bisons (TOR), 3-2. Chris Hernandez took the loss, pitching six innings and giving up three runs on five hits and two walks while striking out two. Alex Wilson and Tommy Layne collected the final six outs combining to allow only one hit while each walking a batter. All of the offense for the PawSox came in one inning thanks to a pair of catchers. After a Christian Vazquez double, Dan Butler hit his first home run of the year off of the left-field foul pole to bring the PawSox within one. Garin Cecchini and Ryan Lavarnway collected the only other hits for Pawtucket and Brock Holt walked as the rest of the lineup was kept off the basepaths. 4/12 Cup of Coffee: Friday night was filled with impressive performances throughout the organization, with Portland and Greenville combining to score 24 runs, Pat Light and Joe Gunkel overpowering the Intimidators, and Brock Holt (pictured) trying to single-handedly carry the PawSox. Manuel Margot continued his power surge for the Drive, and he now leads the entire Boston organization in home runs. 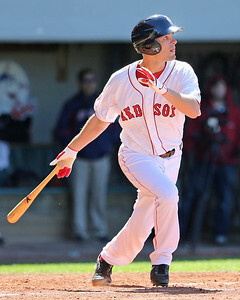 Despite a four-hit performance from Brock Holt, the PawSox fell to the Buffalo Bisons (TOR), 7-4. Jeremy Kehrt was hit hard, surrendering seven runs on 10 hits in five innings of work. Rich Hill and Brayan Villarreal combined to throw three scoreless innings of relief, but the damage had already been done. 4/11 Cup of Coffee: While the major league club lost in frustrating fashion, it was a big night for the Boston farm system. Red Sox affiliates went 4-0 on the night led by some outstanding individual performances. Greenville came back to win in extra innings after its starter set a team record, while Salem also had a comeback to get back to its winning ways. Portland cruised in its home opener, and a big seventh-inning rally led Pawtucket. A five-run seventh inning highlighted a 12-hit Pawtucket attack in a 7-4 win over the Buffalo Bisons (TOR). Brock Holt led the way, going 3 for 5 with a run scored. It was the second three-hit game of the young season for the shortstop, who is 9 for 22 to start the year. Brandon Snyder and Bryce Brentz popped solo home runs in the fourth and ninth innings, respectively. It was the first round-tripper of the season for Brentz, who led the organization in 2013 with 19. He reached base three more times with a single and two walks. Rubby De La Rosa had his second consecutive strong start. The hard-throwing righty allowed a run on only two hits in 5 2/3 innings, striking out four and walking two. Chris Resop picked up his second win of the season in relief, despite getting tagged for three runs in the eighth. Left-hander Drake Britton recorded a milestone, earning his first professional save. Moved to the bullpen in 2013, the Texan allowed just one hit in a scoreless ninth. Position in a Nutshell: Led by the earliest pick the organization has had since 1993, there are plenty of arms to dream on in the low minors after a pair of pitcher-heavy drafts. Where are Ball, Buttrey, and McGrath? This was the question, in some form, that many had when the opening day rosters came out, perhaps in declining order of frequency. 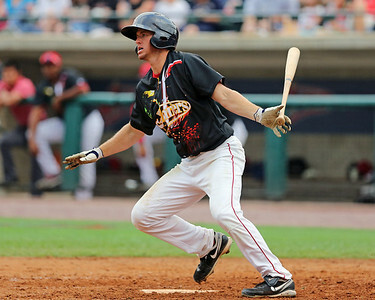 Trey Ball (pictured), the number seven pick overall in June’s draft, was assumed by many to be a lock for Greenville, but as you will read below, the club may have felt him too unrefined to assign to full-season ball right out of the gate. Ty Buttrey’s progression was behind this spring—we saw his first live batting practice in Fort Myers in late March—so he likely needs another few weeks to get ready for the season. As for Daniel McGrath, although he was successful in the Gulf Coast League and a brief cameo with the Spinners in 2013, he likely needs one more go-round through short-season ball before he will be ready to start next year in the South Atlantic League. Top Prospect: Trey Ball, Projection: Mid-season assignment to Greenville – After seeing Ball in Spring Training, the thing that stood out was how raw he was. The potential was clear: He has the tools that comprise a starter’s kit for what a top pitching prospect should look like, but he has a long way to go to actualize those tools. (We recently profiled Ball in the Scouting Scratch, and won’t repeat that info here, so be sure to check that out.) 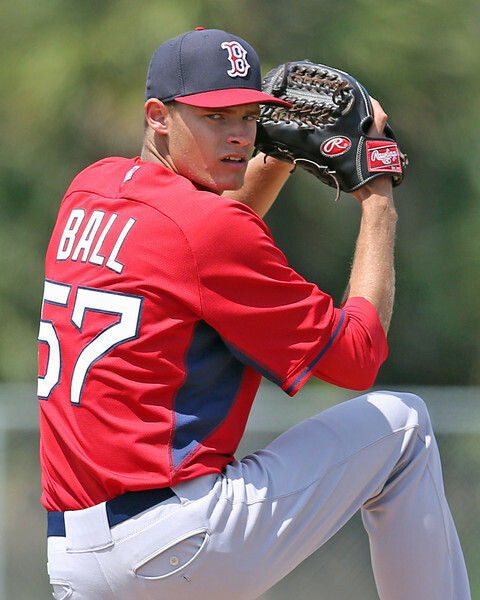 Ball begins the season in extended spring training, but depending on when a roster spot opens up and how he pitches down at the Fort, he could join the Greenville rotation at some point in the first few months of the season. But if he has not received that promotion by June, it would not be out of the question for Ball to head to Lowell, where he could refine his tools in a more structured environment and focus on working on what he needs to in order to improve, rather than focusing on the results. 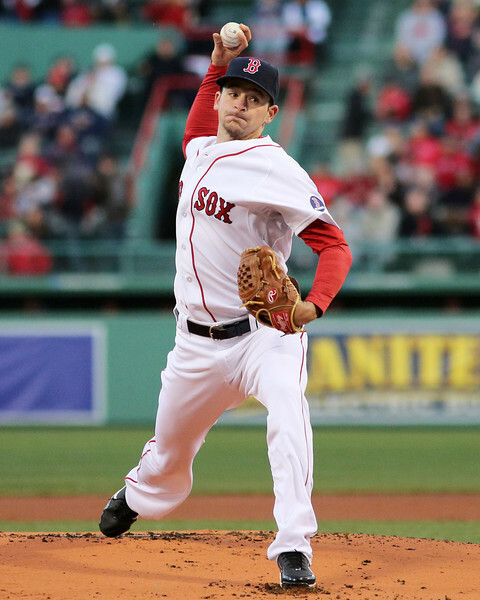 4/10 Cup of Coffee: Portland went on to a 9-1 victory thanks to strong displays at the plate and another strong start from Henry Owens (pictured). Greenville came back from a 3-0 early deficit to capture a win. Salem lost a tight one, 4-2, and Pawtucket turned in a lackluster performance, losing 7-0. The hometown fans at McCoy Stadium did not have much to cheer for Wednesday as the PawSox fell 7-0 to the visiting Syracuse Chiefs (WAS). PawSox starter Anthony Ranaudo struggled in his second start of the season, yielding extra base hits in each of the first three innings. After giving up four earned runs in the first three frames, he settled in and pitched a hitless fourth and fifth innings. In 5 2/3 innings, he gave up seven hits, five runs (four earned) and one walk while amassing four strikeouts. The PawSox bats were stymied by the Chiefs pitching staff, producing only five hits, all singles, on the day. Pawtucket's best chance to make it a game probably came in the bottom of the fourth inning with the score at 5-0 Syracuse. Third baseman Brock Holt led off the inning with a hit by pitch, which was followed by a one-out walk from Brandon Snyder. With two men on and one out, first baseman Ryan Lavarnway grounded into an inning ending double play, ending the threat. The Red Sox announced a roster move Wednesday morning. The team has activated left-handed reliever Craig Breslow and optioned righty Brandon Workman (pictured) to Triple-A Pawtucket. 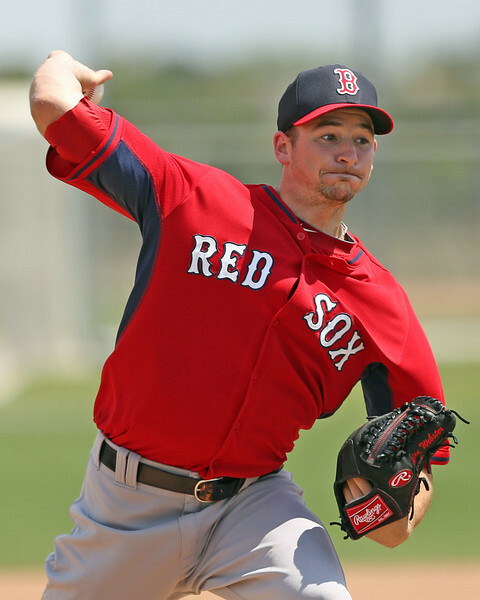 Breslow resumes his place as the top lefty in the Boston bullpen, the role he held in 2013. 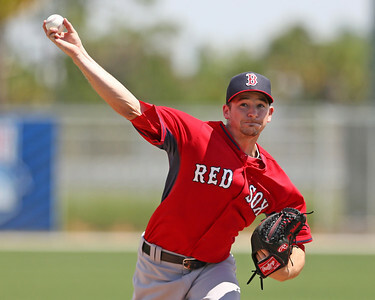 After breaking camp in the Boston bullpen, Workman is projected to be stretched out as a starter with the PawSox. Workman's move comes the day after saving the major league bullpen with a strong four-inning outing in which he allowed just one run on two hits, striking out three without walking a batter. Overall, the 25-year-old has appeared in three games in the early part of the season, allowing just the one run in 6 1/3 innings. Twenty of Workman's 23 major league appearances have been out of the bullpen, but he is expected to join the Pawtucket rotation, a role the former Texas Longhorn has been used in almost exclusively during his minor league development. Since being selected in the second round of the 2010 draft, Workman has a 3.50 ERA and very impressive strikeout-to-walk ratio of over 4.0. 4/9 Cup of Coffee: Salem captured its fifth straight victory after coming out on top in an offensive battle. Pawtucket cruised to its second straight with stellar pitching and clutch hitting. Portland and Greenville both had lackluster efforts, falling 10-1 to their opponents. Moving to 4-2 on the season, the PawSox rode an impressive outing from Allen Webster (pictured) to a 7-1 victory over the Syracuse Chiefs (WAS). Webster, who picked up his first victory of the season, tossed six innings, allowing just three hits and two walks while punching out three. Tommy Layne added two innings of scoreless relief, allowing a walk and two hits on his way to striking out four. Drake Britton came on for the ninth, allowing a run on two hits and two walks. Portland's Betts easily slugged his way to the first weekly award of the 2014 season, garnering all but two votes. 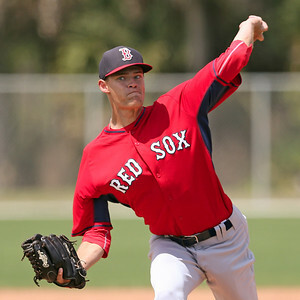 He is currently ranked the number 10 prospect in the organization by SoxProspects.com. Owens completes the Sea Dogs' sweep in this week's voting with six innings of no-hit ball with an impressive nine strikeouts. SoxProspects.com ranks him third overall in the system. Position in a Nutshell: In the middle tier of the system, there is one stud above everyone else, with a few intriguing arms to compliment him. 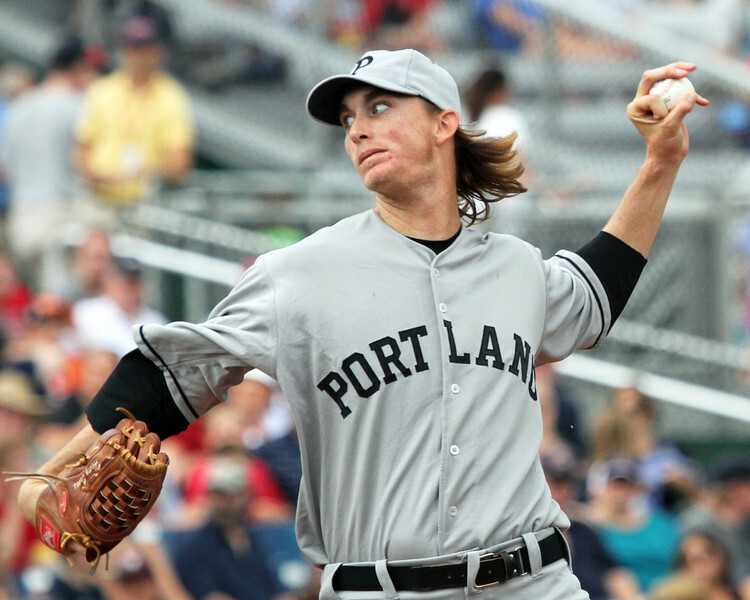 Top Prospect: Henry Owens, Assignment: Portland – There is not much to say about Owens (pictured, above) that hasn’t been said already. Owens knows how to pitch, and more importantly, he gets outs. While his fastball velocity does not stand out, a combination of his length and deception allow the pitch to play up and elicit poor swings from hitters. When you combine that with two potential solid-average-to-plus secondary offerings, you have the makings of a solid big league starter. Owens is back in Portland to start the year and is already off to a flying start, throwing six no-hit innings in his debut with nine strikeouts. If he continues to have anywhere close to that level of success, he will be short for the level and pushing for a promotion to Pawtucket. 4/8 Cup of Coffee: It was a quiet night on the farm, as two of the three scheduled contests were postponed due to inclement weather. Pawtucket ended up as the only affiliate to play on Monday, opening its series with a thrilling 10-inning win. Pawtucket kicked off a three-game series at McCoy Stadium with a 3-2 victory in 10 innings over the Syracuse Chiefs (WAS). Rehabbing lefty Craig Breslow started for the PawSox, pitching a perfect first inning as he nears his return to the major league squad. Chris Hernandez, who normally would have taken his turn in the rotation, came on in the second inning and allowed only one unearned run on seven hits in 4 2/3 innings. FORT MYERS, Fla. -- When Greenville right-hander Myles Smith makes his South Atlantic League debut this week, he’ll be bringing to the mound with him mechanical changes that aim to harness his lightning-quick arm. In his first spring training last month, Smith worked on a new delivery that maximized his athleticism and helped him control his live, tailing fastball more effectively. “Before [the change], my body would be ahead of my arm, so my arm was late,” Smith said. When a pitcher’s arm drags, he tends not to use his entire body in his delivery. Putting too much stress on the arm can lead to shoulder issues, and makes pitches harder to command. 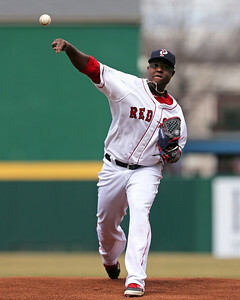 PAWTUCKET, R.I. – In 2013, Rubby De La Rosa made a habit of providing tantalizing glimpses of the talent that once made him one of the top 100 prospects in the game. Of course, he also made a habit of having frustrating stretches in which he lacked control and failed to go deep into games. So far in 2014, so good for the 25-year-old Dominican right-hander, who went five shutout innings, allowing just two singles and striking out five hitters in his season debut on Saturday. De La Rosa had all of his pitches working, and perhaps more importantly, threw strikes for most of his outing. 4/7 Cup of Coffee: The PawSox and Sea Dogs both lost close games, while Salem's pitching staff, led by Corey Littrell (pictured), dominated the Pelicans. After a strong start, Teddy Stankiewicz faded towards the end of his outing, and the Drive fell to the Intimidators despite some impressive offensive performances. Pawtucket's late rally fell just short, as they fell to the Lehigh Valley IronPigs (PHI), 5-4. Christian Vazquez and Garin Cecchini continued their hot starts to the season, with Vazquez going 2 for 4 with a double and Cecchini going 1 for 3 with a walk. Heiker Meneses was the only other player to record multiple hits, as he went 2 for 3 with a walk. 4/6 Cup of Coffee: The Sea Dogs were the only affiliate to lose, done in by some shaky pitching. Pawtucket and Greenville rode dominant outings to victory while Salem managed to notch their third straight victory. The PawSox put together a 10-hit barrage behind Rubby De La Rosa to down the Lehigh Valley IronPigs (PHI), 6-4. De La Rosa shut down the IronPigs over five innings of work, striking out five and allowing only two hits, both to former major league players. The bullpen was not so fortunate. After pitching a scoreless sixth, Chris Resop walked two straight batters before giving up a two-run double, and Drake Britton was unable to prevent further damage, letting in another two runs in the inning. 4/5 Cup of Coffee: Led by strong showings on both sides of the ball, Pawtucket, Portland and Salem all took home victories. Greenville, meanwhile, was the only affiliate to take the loss as their pitchers struggled. It was a day of mixed results for Anthony Ranaudo, who surrendered four runs on four hits, only one of them earned, en route to a 9-4 Pawtucket victory over the Lehigh Vally IronPigs (PHI). Ranaudo lasted only four innings while walking four, and striking out seven. All four of Lehigh Valley's runs came in the fourth, including a three-run home run to cap it off. Behind Ranaudo, the PawSox deployed the rehabbing Craig Breslow who surrendered the IronPigs only other hit on the night and picked up the win for Pawtucket. Rich Hill and Alex Wilson combined for three scoreless innings, though they did walk four batters between them. PAWTUCKET, R.I. -- Allen Webster (pictured) entered his Opening Night start for the PawSox at McCoy Stadium hoping to prove he had moved on from the troubles that plagued him in 2013, when he displayed his excellent raw stuff, but dealt with control issues that completely washed out some of his starts. However, it was not to be, as he walked two over 3 2/3 innings and threw 35 of his 81 pitches for balls. There were certainly silver linings, however. Though he allowed seven hits, one was of the broken-bat variety, and a couple others were not well-hit. He limited the Lehigh Valley IronPigs to three runs in an outing that manager Kevin Boles described as a battle. Position in a Nutshell: In terms of near-MLB-ready pitching talent, the Sox are perhaps the deepest in the game. What are the Red Sox realistically going to get out of the Workman/Webster/Ranaudo/De La Rosa/Britton group? Time for our annual “pump the brakes” chat. These five represent one of the best near-major league-ready groupings of pitchers in the game, if not the best. But that does not mean the group will definitely become the better part of a future Red Sox rotation plus a late-inning bullpen arm or two. As you will read below, all have questions. Fixing those issues will allow them to reach their ceilings as at least mid-rotation major league starters, while not doing so could lead all of them to become bullpen arms, and not necessarily late-inning ones. Perhaps the best recent example of a similar assemblage of talent was the Orioles’ group of Chris Tillman, Brian Matusz, Jake Arrieta, and Zach Britton. All four were ranked at least in the top 75 of Baseball America’s Top 100 in 2009 or 2010, and of the four, only Tillman looks to be a major league starter. That is not to say that the Red Sox group will face a similar fate, but something similar is within the range of reasonable results, particularly given that Tillman, Matusz, and Britton were all Top 30 prospects at one point, something nobody in this particular Sox group can boast quite yet. 4/4 Cup of Coffee: The 2014 minor league season kicked off on Thursday, with the 2013 SoxProspects Pitcher and Player of the Year both picking up right where they left off to lead Portland. Salem and Greenville also picked up wins behind strong pitching. Pawtucket was the lone affiliate to be handed an Opening Day loss. It was a tough opener for Pawtucket, who managed only two hits in a 4-0 loss to the Lehigh Valley Iron Pigs (PHI). Allen Webster got the Opening Day nod for the PawSox, and Lehigh Valley got to him early, tagging him for two runs in the first inning. The right-hander never fully settled in, allowing at least one hit in each inning. In all, he allowed three runs on seven hits in 3 2/3 innings, striking out four and walking two. A parade of five relievers threw the final 5 1/3 innings, including rehabbing left-hander Craig Breslow who walked two in 2/3 of an inning but did not allow a hit. 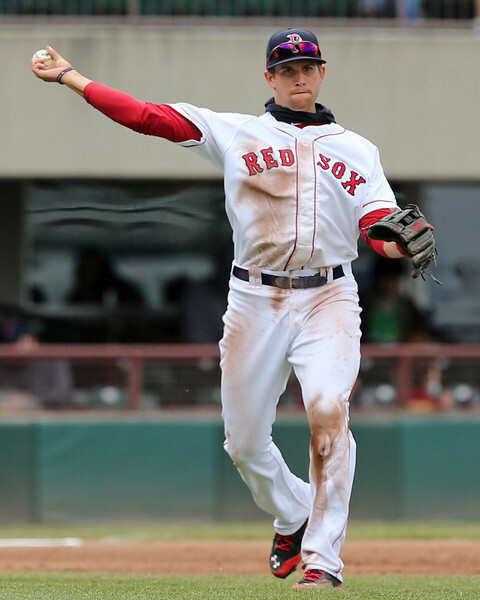 PAWTUCKET, R.I. -- Garin Cecchini had the highest on-base percentage of all qualifying minor leaguers last year at .443, a mark that even eclipsed by a point that of Miguel Cabrera, last season’s leader in Major League Baseball. But Cecchini sees that more as a step in his journey to the majors, than an accomplishment in itself. While known for his patient approach, Cecchini also has a lifetime .312 batting average in the minors. It is not just patience that leads to his success, according to Red Sox Director of Player Development Ben Crockett, but also his willingness to be aggressive at the plate. Minor League Opening Day 2014 is here, and we're getting you ready! Chris, Jon, and Ian talked about the season-opening rosters at the four full-season affiliates, touching on Trey Ball and Ty Buttrey's absence from the Greenville roster, the conservative initial assignments of several pitchers, and of course the strongest (Pawtucket) and weakest (Salem, by far) rosters. The Red Sox have released outfielders JC Linares and Scott Cousins and pitcher Francisco Taveras, according to SoxProspects sources. Those sources also confirmed that outfielder Drew Turocy retired from baseball during the offseason. Linares was originally signed to a $750,000 bonus after defecting from Cuba in 2010. At the time of his signing he was considered an advanced defensive center fielder with good speed and power potential. Linares impressed during an invite to major league spring training in 2011, but suffered a devastating ankle injury 17 games into the regular season that cost him the rest of that year. Linares got off to a strong start with the bat in 2012 with Double-A Portland, but played more right field and designated hitter due to the lingering effects of the injury. Though he earned a midseason promotion to Pawtucket, Linares spent most of 2013 back in Double-A. Coming into Spring Training, Trey Ball and Rafael Devers were the two prospects I was most interested in seeing. After getting my first look at both, here are my initial impressions on two of the top young prospects in the lower levels of the system. - Ball (pictured) struggled somewhat during the appearance we saw, but he did show off the tools that allow you to dream on him. The first thing that stands out is his frame; he is tall and lanky, but with an extremely projectable frame. He has plenty of room to fill out without hurting his current athleticism. On the mound, Ball has a fluid, low-effort delivery. He uses a high leg kick and throws from a three-quarters arm slot. His arm is loose and there is not much wasted motion in his delivery. During the outing, Ball did get out of sorts at times, as he could not find his release point and was opening up early with his arm dragging behind. As a result, he was constantly missing up-and-away to right-handed hitters. The Triple-A Pawtucket Red Sox announced their roster on Tuesday, and it is one of the most impressive in recent memory. The strength of the team will be its starting pitching, with Allen Webster (pictured) taking the mound on Opening Day, followed by Anthony Ranaudo, Rubby De La Rosa, Jeremy Kehrt, and Chris Hernandez. Matt Barnes, who is currently in extended spring training working his way back from a sore shoulder, is aiming to come back towards the end of the month, and Steven Wright will begin throwing in May after having hernia surgery in January.